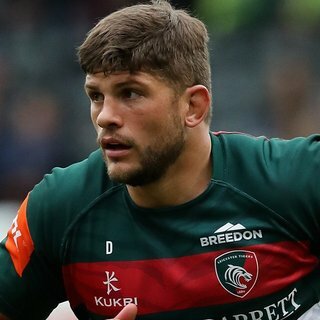 Leicester Tigers recorded a first away win of the season with a 31-28 verdict at Harlequins on Saturday in Round 4 of the Aviva Premiership season. Telusa Veainu provided the only try of the opening half, showing good pace and a clever finish in the right-hand corner, with George Ford kicking the other points as the visitors went at the break 11-9 in front. 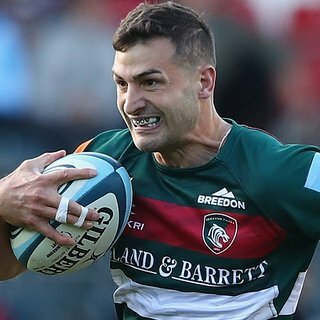 But two tries in the opening minutes of the second half from Quins threatened to change the change completely, before Tigers replied in similar fashion through Jonny May and Greg Bateman to set up an enthralling final quarter as the lead continued to change hands regularly. A final penalty from Ford gave Tigers the lead for a fourth – and final – time in the afternoon as Tigers recorded a second successive win at The Stoop. After a first win of the season against Gloucester in Round 3, head coach Matt O’Connor welcomed back Dom Barrow in the second row and Dominic Ryan at flanker, with Joe Maksymiw missing out and Luke Hamilton reverting to the bench. Harry Wells, retained in the second row, made his 20th first-appearance to qualify for his player’s tie. 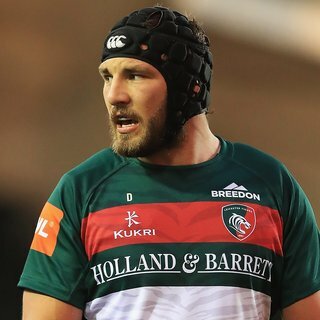 After Harlequins kicked off, buoyed by an away win over Wasps in the previous round, they held ball for the opening three minutes, getting through a dozen phases of play before gaining a penalty when Tigers played themselves into trouble on their own line. Fly-half Marcus Smith, this week named in England’s training squad, kicked them into a three-point lead. 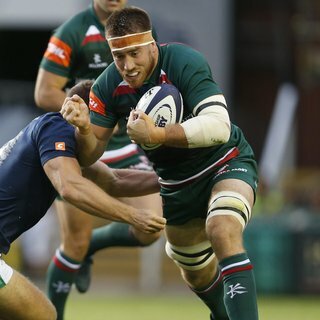 Tigers were given an instant opportunity to reply when Quins knocked-on at the restart and then penalised at the scrum, allowing Ford to level the scores with a kick from 35 metres. 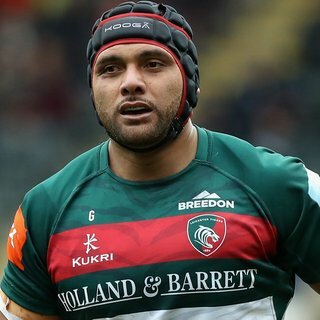 A succession of penalties against Quins began with Mark Lambert failing to roll away from a tackle on Ellis Genge and, after setting up a drive at the resulting lineout, Tigers looked to keep the pressure on the home defence. They finally got a reward when quick lineout ball on the left and carries from Mike Williams and Sione Kalamafoni provided fresh momentum. Jonny May entered play on the right and Veainu slid to the tryline. The assistant referee had the perfect view and confirmed the score to referee Ian Tempest. Ford, though, could not add the conversion as Tigers led 8-3 with 13 minutes gone. Fly-half Smith cut the deficit with a three-pointer after Genge was penalised in a central position and Tigers lost Ryan to a head injury assessment during the break in play, with Hamilton entering the action. Veainu showed another flash of brilliance on a run upfield just after the 20-minute mark, wrong-footing a succession of defenders as he straightened his line, but May and Nick Malouf were unable to latch on to the opportunity on the right with Quins running out of cover. There was a scare at the other end when Malouf was hit as he tried to claim a kick and then Marcus Smith anticipated a pass from Ben Youngs, but Veainu raced across to make the tackle. Respite did not last long, though. Dan Cole was penalised for a deliberate knock-on 25 metres out and Smith confidently added the kick to give the hosts a 9-8 advantage. Veanui sniffed another opportunity when Quins knocked-on at the restart and Tigers set up an attack from the scrum. The defence quickly closed down on the Tonga international but Tigers still had an opportunity when Quins were penalised for a high tackle. Tigers were gaining some reward at scrum time too, but after two penalties within reach of the line, it was the visiting pack who were then penalised at the set-piece and Quins were able to clear. They could not keep Tigers out of reach for long, though, and Ford landed a penalty kick from the right when Quins were whistled at a breakdown to reclaim the lead for the visitors just two minutes before half-time. Neither set of coaches made any changes at half-time, but it was Quins who gained the breakthrough with two tries in a two-minute spell. First Danny Care scored with a tap penalty and then heavyweight back-rower Mat Loamanu rampaged his way to the line in the corner. 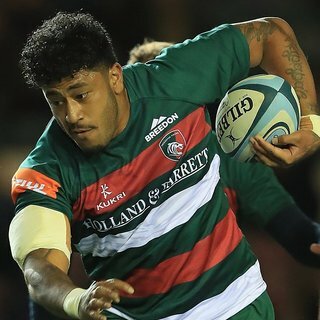 As Quins forced Tigers off their ball at a scrum on halfway, Alofa Alofa threatened with a run up towards the line. But at the recycle, Care’s pass picked out Genge who was still retreating. The referee awarded a penalty and Care went for the tap and darted to the line to the left of the posts. The conversion from Smith made it 16-11 to the hosts with 43 minutes gone. And 90 seconds later, Quins latched on to loose ball near halfway and, with Chris Robshaw flat out injured in the middle of the pitch, Marland Yarde broke upfield before Loamanu arrived on his right shoulder and outpaced the defence to score and provide a 10-point cushion. Referee Tempest lost his patience with the props at the next scrum, showing a yellow card to Genge and Will Collier as the front rows went to ground, while Quins also lost fly-half Smith to injury, with Tim Swiel brought off the bench. As the game opened up, Tigers grabbed a second try and a foothold in the game, with Matt Toomua tempting the Quins defence out and delaying the pass long enough to pick out May on the left and he ran round Yarde to score his fourth try of the season. Ford’s extras made it 21-18. 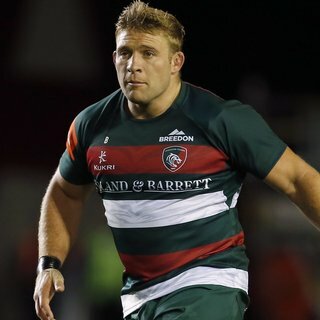 Harry Thacker replaced skipper Tom Youngs before Quins kicked off again and Tigers were quickly back on to the front foot with a scrum on halfway after some obstruction from the Quins attack. And after a strong carry from Hamilton and then Malouf, and with a penalty advantage being played, replacement Bateman showed some sharp finishing skills for a try which wrestled the advantage back in the direction of the visitors. Ford’s conversion made it 25-21 in their favour. A see-saw encounter continued as Quins claimed the next score on 63 minutes. First, Tigers repelled charges from Loamanu and Roberts, with Ford making a superb stop on the Welsh centre, but then Care picked out a run from Alofa on the left with the defence short-handed and he ran through behind the posts to score. Swiel’s conversion swung the scoreboard in the hosts’ favour at 28-25. Ford quickly levelled the scores again with a penalty from the edge of the 22 as both sides still struggled to retain any advantage. One phase of play around the 72-minute mark had fans from both sides on their feet as Yarde broke free on the Quins right. First, he kicked over Veainu as Genge made a tackle, then Malouf chased Ford’s clearing kick all the way up to the home side’s tryline. When the referee blew for a penalty against Quins, he ran through the play with the television match official before returning for the Tigers penalty. Ford kicked the three-pointer to claim the lead for a fourth time with just six minutes remaining but the Tigers defence still had to stay on task, keeping Quins in their own half. Another period of pressure promised a final, decisive score from Tigers, with Sam Harrison and Genge going close, but Quins stuck on their tackles and when Tigers went wide, ball was lost just five metres out with less than three minutes remaining. The next three minutes were played out just metres from the Quins line as they kept hold of the ball and Tigers kept tackling, before a final spill allowed the visitors to claim possession and kick out to secure a hard-fought win. What an advert for the Aviva Premiership. It was a game that had everything, the lead swapping hands time and again, brilliant tries and huge hits. Don't miss the highlights! Tigers claim their first win on the road, and their second in a row, with a gutsy, battling performance at The Twickenham Stoop. What a game! Referee Tempest goes to his TMO to check Genge and Veainu's tackle on Yarde. It's all good! Genge makes the tackle on Yarde as he chips ahead. Tigers counterattack. Malouf wins the foot race to Ford's kick. He is held by Roberts and Tigers have the penalty on the Quins line. Ford kicks the penalty, and it is 28-28 in Twickenham. All to play for in the last 13 minutes. What a try! What a match! Greg Bateman charges on to Ford's flat pass, steps around England's Mike Brown and scores a beauty by the posts. 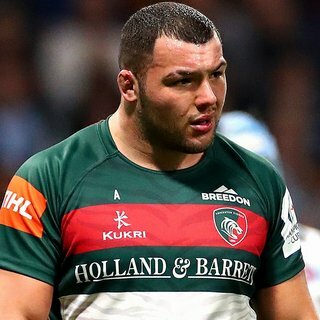 Ellis Genge in full flow is a thing of beauty. He charges over Jamie Roberts but spills the ball as he goes to ground. 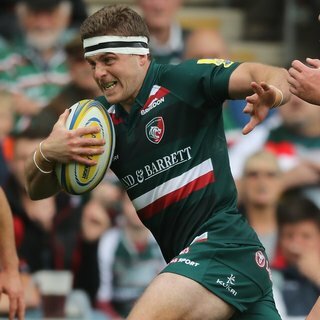 George Ford kicks off the second half, with Tigers attacking the end to the left as we type! Tigers fans tuning into the game across the world! That's half-time. Tigers hold a two-point lead, thanks to Veainu's first try of the season and six points for George Ford. Tigers win two successive penalties at the scrum 5m from the Quins line, pack down for a third time, and referee Tempest awards the penalty against the visitors! England head coach Eddie Jones has made the short trip from Twickenham HQ to Twickenham Stoop to watch today's proceedings. Malouf can't deal with an up-and-under before Ben Youngs throws a speculative pass that is picked off by Smith. He loses possession forwards as Veainu hits him from the side. Slight confusion around the Stoop as Veainu is tackled just short of the line, but his momentum took him over. The try is confirmed by the touch judge and Tigers lead for the first time! 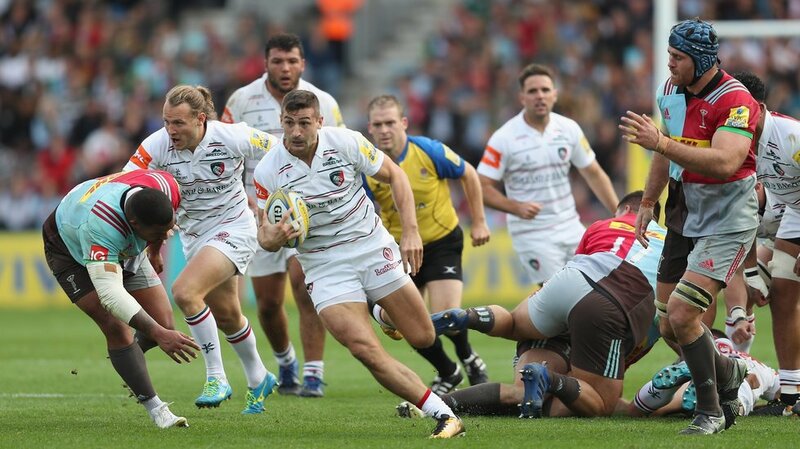 Harlequins welcome Leicester Tigers to the Twickenham Stoop on Saturday with both teams chasing successive Aviva Premiership victories. 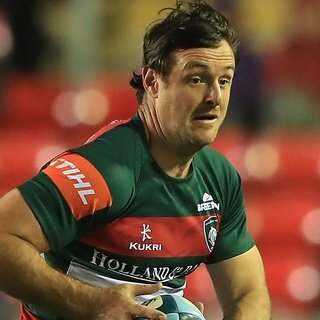 While Tigers notched a first win of the season against Gloucester in Round 3 a week ago, Quins were making it two in a row as they backed up a home win over Gloucester by becoming the first Premiership team to win on Wasps territory last Sunday. Quins are chasing a hat-trick of league victories for the first time since May 2014. Tigers, though, did claim a home-and-away double over their rivals last season – for the first time since 2010/11 – with Sam Harrison and Freddie Burns on the scoresheet in a 27-18 win at The Stoop in February. Team news was announced by both camps at noon on Friday, with Tigers head coach Matt O’Connor recalling Dom Barrow after injury and giving Dominic Ryan a place in the back row. Quins give a starting place to new England squad member Marcus Smith at fly-half but are without prop Joe Marler after he suffered a rib injury in the win over Wasps in Round 3. Tigers will wear the club’s all white alternate kit at The Stoop. Referee is Ian Tempest in his 34th Premiership match in charge. Kick-off is at 3.00pm and there is live coverage on BT Sport.